We’d love your help. Let us know what’s wrong with this preview of Finding Fire, Flesh and Blood, and The Loka Legends Sketchbook by Jay Bell. 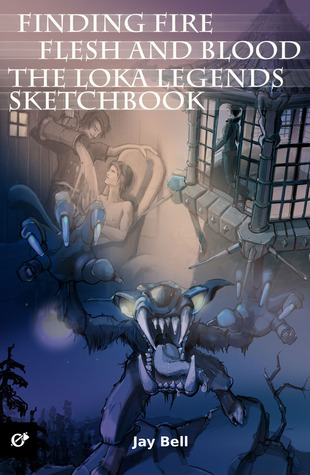 To ask other readers questions about Finding Fire, Flesh and Blood, and The Loka Legends Sketchbook, please sign up. I quite enjoyed the short stories included in this. The first in particular as we get more background on what happened between Dylan & Rano that was alluded to in Cat in the Cradle which was nice since Rano was sort of the reason why everything started. Being such an important catalyst for Dylan's adventures, it was nice to get more info. The vision of the future that Dylan had while scrying with his father, that was icing on the cake. Oh how I wish we had that in real life! It reminded me o I quite enjoyed the short stories included in this. The first in particular as we get more background on what happened between Dylan & Rano that was alluded to in Cat in the Cradle which was nice since Rano was sort of the reason why everything started. Being such an important catalyst for Dylan's adventures, it was nice to get more info. The vision of the future that Dylan had while scrying with his father, that was icing on the cake. Oh how I wish we had that in real life! It reminded me of dreams I've had where you don't know exactly what things mean in the dream but when you wake, you're left with the residual feelings that stay with you. I also enjoyed learning more about Nikolai's background as he was an interesting character. Such a tragic past. He & Lali would make a great couple should he ever take the initiative I think. While he still has a lot of reservations about it (as we learn the reasons why) he & Lali would complement each other nicely. I also enjoyed his meeting Dylan & company from his perspective. When we first read of Dylan stumbling on Nikolai & the rest of the Purple Oligarch's legacy, there was nothing but an air of mystery. Like, was Nikolai really going to attack them once he was released? Could he be trusted? But when we see it from his point of view, there was nothing but innocence, hurt, and worry for the other animals. The first story is about innocence being lost in some ways. Dylan has feelings toward a friend who just happens to be a boy and Dylan doesn't see anything wrong with that. He doesn't understand why that could be a problem, but the events in the short make him more cautious. It changes his outlook moving forward. It helps you understand where Dylan is at in the beginning of the first book a lot more. The second story is set between the first and second books. Nikolai tells Lali the tale of how he The first story is about innocence being lost in some ways. Dylan has feelings toward a friend who just happens to be a boy and Dylan doesn't see anything wrong with that. He doesn't understand why that could be a problem, but the events in the short make him more cautious. It changes his outlook moving forward. It helps you understand where Dylan is at in the beginning of the first book a lot more. The second story is set between the first and second books. Nikolai tells Lali the tale of how he became a werewolf. It's a lot darker than the first for sure. It really gave some great insights into Nikolai's character. Where this story ended gave me a lot of feelings I was not expecting to have. Nikolai is probably my favorite werewolf I've read in fiction.his motivations and internal struggles are so compelling to me. I won't do a full review of this book, since it's just a couple of short stories, which are hard to review without spoiling. The stories are related to the author's Loka Legends series, which I haven't read. The shorts didn't make me want to read the other books, but I don't think that was their intention, and it's not a knock on the stories, it's just that this kind of fantasy isn't really my thing, as much as I like Jay Bell's writing.